me and him: no cash. no credit. no debit. no service. no cash. no credit. no debit. no service. our fridge has been pretty much empty for the past few days. my list of items to nab at the local grocery has been growing. it's kinda sad. it might be a little wussy. but, as many (most) of you know, I hate grocery shopping. BUT even more than I hate grocery shopping--I hate grocery shopping for lots and lots and lots of things, especially if toilet paper or pads (sorry dudes. it's true though.) happen to be on that long list. overflowing carts make me nervous. might be weird. that's ok. it's me. we had no more milk. grabbed my purse. grabbed the keys. grabbed my (long) list. got in my car and cruised down the road at 25 mph for Albies. I decided that I wasn't going to take long. I decided I was on a mission and I meant business. 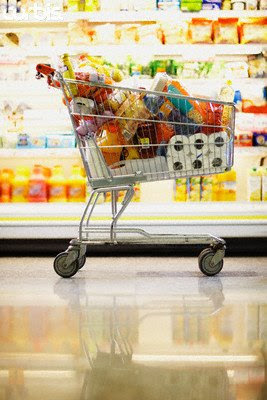 once I was finished selecting my many items (filling my cart in the process..... we're talking full) I hurried to an empty line, digging in my purse on my way. before I reached the line I realized I didn't have my wallet. crap. I dug some more and found the checkbook. something still felt funny about just having a checkbook so I decided I should ask if they would accept checks w/o an id. "have you written a check here recently?" "the machine will need your id then." "could I give my social security number?" I looked at the clerk. then I looked back at my freaking FULL cart (which in fact, included toilet paper). crap. I whimpered a giggle. managed a smile. rolled my cart past the empty checkout line. and wiped a little bit of sweat off my forehead. my mind raced. I was sooooo not about to start putting back all the stuff in my cart. and further more, I was NOT about to leave the store w/o the things on my list. I grabbed my cute orange phone and called Jason. no answer. what? I had talked to him minutes before. I knew he was home. I knew he had his phone. what should I do???? I did the first thing I could think of. I called my nice neighbor (& graphic design) friend. "no, I'm at Walmart. do you need something?" I told her my predicament. she called her husband. her husband knocked on our door. Jason was informed to call me or die. my phone rang. it was Jason. he ran (or drove very quickly) to Albies. after we got home I started to unload the car and load up the cupboards and fridge. I noticed I forgot eggs. I noticed I forgot granola bars. I started a new list. You were my only child that didn't want to go to the store with me. There was nothing there worth taking the chance of following me with a FULL cart. You are a weirdo for sure. Actually, I don't think Toby liked to come, either. He had no phobia though. Just wasn't interested in anything there, either. That is funny/sad Ger! I hate those paniced feelings! Good thing Jason came to the rescue! I am surprised that Albertson's wasn't gonna buckle in your time of need! So why wasn't Jason answering his phone? he forgets to turn up the volume from silent after he gets out of class. i called him and waited for 20 min. Geri you CRACK me up--and I'm with ya on the hating shopping mode. It is Friday, and I have put off inevitably again til the last moment shopping for groceries so I'm going for it today. I swear I cover the store's entire area 3 times over cuz I wander and forget items. AAAhhh! Ger, I've forgotten my wallet so many times that Justin asks me BEFORE we even get out of the van, "mom, do you have your wallet?" If a 3 year old has to ask that every time I might have a problem. Sometimes I'm lucky and it is just in the van instead of my bag, but too many other times it is just at home. BTW-Wal-Mart can put your order on 'suspend' mode and they give me a little print out with a bar code and then I leave my cart there and run and get my wallet and come back and they scan my bar code and then I pay and then I get the heck out of there. You're the best english major ever! I was totally into your little mishap! Geri, I love your blog. And you. that was hilarious!!! hahaa!! geri geri geri! i hate that feeling of not having any money with me! glad jason came to the rescue. oh ya and feel free to call me whenever about the mac. when we got ours ben's cousin logan was my lifesaver. My first incident was when i put a cd into the side of the computer and couldn't find the eject button! i freaked... thought maybe that wasn't the real cd slot! anyways i would completely understand if you needed help!! I notice the TP in the grocery cart you posted a picture of was buried in the bottom. Maybe you are not the only one that doesn't like to be seen with it.